A partial solar eclipse will peak in the Eastern Hemisphere overnight between Saturday, January 5 and Sunday, January 6. Skywatchers in remote Siberia have the most advantageous views as five-sevenths of the sun’s diameter will be blocked out, according to Space.com. Tokyo will have 30 percent coverage, while Seoul has 24 percent and Beijing has 20 percent. Unfortunately, people in the UK will not be able to see anything but do not worry as a lunar eclipse always follows soon after a solar one. The second eclipse of the year is on Monday, January 21. If that has got you wondering which other celestial dates you need to book in your diary then Express.co.uk has got you covered. Check out our list below, all dates taken from TimeandDate.com. This lunar eclipse is known as the Super Blood Wolf Moon. The eclipse is “super” because it is a supermoon, a phenomenon where a full moon appears 14 percent bigger and 30 percent brighter than usual. It happens as the moon makes its closest orbital approach to Earth, appearing within 10 percent of the point of perigee. A blood moon occurs when the moon appears red during a total lunar eclipse as only certain light is refracted through the earth’s shadow. And a wolf moon means any full moon in January. The good news is this eclipse will be visible in the UK from start to finish, with the full eclipse beginning at 4.41am GMT. The total solar eclipse will be visible for only small areas of Chile and Argentina, shortly before sunset. But people residing in Ecuador, Brazil, Uruguay and Paraguay also have a chance of seeing a partial solar eclipse, weather permitting. 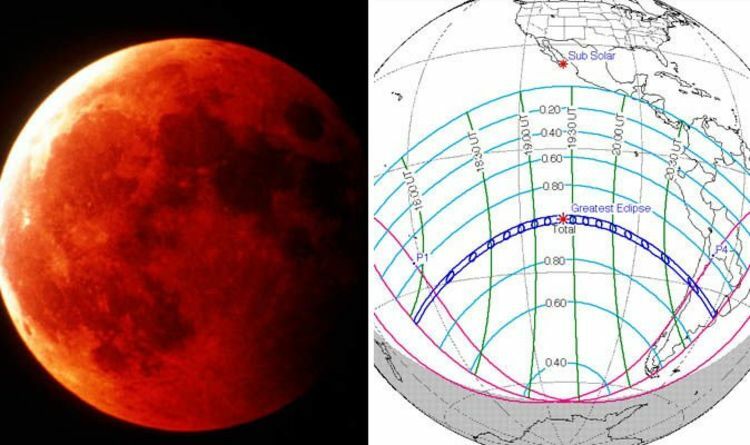 The next lunar eclipse of 2019 starts at 6.43pm GMT. Stargazers in Britain will only be able to see the lunar event once the moon is above the horizon. This means they need to wait until the start of the maximum eclipse, running from 9.30pm to 10.30pm. Large swathes of the planet will get to see at least a partial eclipse on this occasion but USA and Canada will miss out. This unusual event will see the planet Mercury move across the sun for the first time in three years - the phenomenon will not happen again until 2032. A transit of Mercury means will cross the face of the sun blocking out the rays to the earth. As long as the weather is clear, most of the world will be able to see it all. In the UK, the Mercury transit will start at 12.34pm GMT - but remember you should never look at the sun directly. The final eclipse of the year is on Boxing Day and it is a good one - a mystifying annular solar eclipse. This occurs when the moon appears smaller than the sun as it crosses its path. The result is a bright ring, or annulus, of sunlight being visible during the eclipse. Unfortunately, this eclipse will not be glimpsed from the UK. But most of Asia, north-west Australia, parts of east African, and eastern Europe will get to see the dramatic display.